Aria & The Loft @ Uber - Phelan Bedroom Suite | Flickr - Photo Sharing! 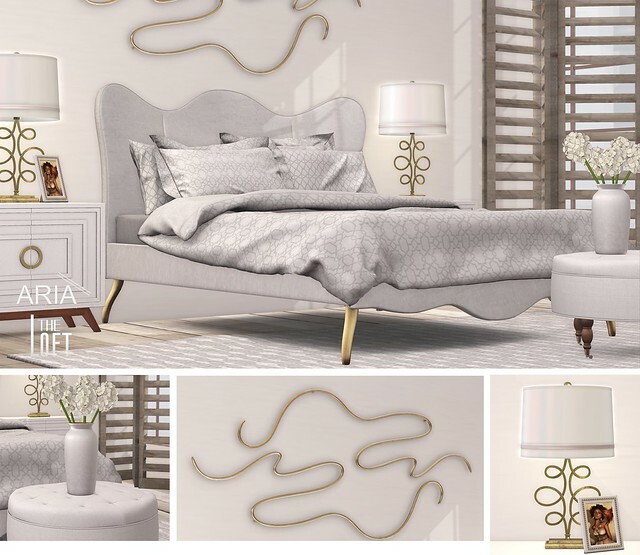 For this round of Uber - Freedom (Starts January 25th), ARIA and The Loft bring you a soft modern bedroom suite. The Phelan Bedroom Suite includes organically shaped elements that are booth sensual and classic. It comes with a bed which has 3 bedding texture change options built into it and is loaded with hand picked animations that include animations for single avatars, couples and a group of up to 4 friends. The suite also includes an original abstract wall art piece, a bedside table, a round pouf, bedside light and a vase with hydrangeas flowers. The bed and pouf come in 3 different versions of upholstery. The Phelan Bedroom Suite totals at 24 LI, it comes with copy and modify permissions and is materials ready. Ayriane M., MaejorM, Unicorn Herder, and 111 other people added this photo to their favorites.